Explore our surf holiday destinations in Spain. 2.5kms long beach caters for all standards. Surfing in Spain began in the earlys 1960's around the northern town of Santander. One of the early pioneers was Jesus Fiocchi who had spent time in France and took a surf board back to his home town in Spain. Like many places in Europe back then it was slow to take off, most of the local residents would have looked on at a few people in the water and considered them crazy to be out in the big waves. There were no easy access to equipment until the early 70's when the first Spanish surf board factory was opened, Santa Maria Surfboards. What's the surf like in Spain? Surfing in Spain is centered around Cantabria and the Basque region, mainly in towns like Zarautz and Santander. It has grown to Andalucia and further north west, with a mix of locals and foreigners exploring regions that were more off the beaten track. Surfing Spain is an amazing experience because it takes you to the unspoilt northern part of the country, away from the touristy regions of the south. Be prepared to come surf beautiful empty beaches and explore historic and traditional old towns. The most popular region for Spain surfing holidays. Facing the Bay of Biscay and far away from the package holiday destinations of the Costa del Sol. Travelling around this region will give you a taste of what the old Basque country is like - beautiful historic old towns & villages and a mix of great beginner, intermediate and advanced surf. The main surf town in the Basque country is Zarautz, unofficially Spain's surf capital. It is home to one of the most consistent beach breaks in the country stretching for 3 kms. A fantastic place for a Spain surfing holiday and to experience the Basque history and culture first hand. It has a picturesque old town square full of restaurants & cafés serving up delicious Pintxos. A promenade faces the long beach which is full of surf shops, cafés, restaurants and plenty of space for walkers, skateboarders and a cyclists. There is even space for a golf course at the end under the beautiful Talaimendi mountain. Closer East is San Sebastian, one of Europe's most incredible cities. The beautiful La Zurriloa surf beach is practically in the old town centre and surrounded by two magnificant hill tops. Further West is the area around Bilbao, the Basque capital. The area is home to Spain's two most famous waves, the left hand rivermouth wave park Mundaka & the big wave right Menakoz. On their day they can produce some of the best barrels in the world. This is home to arguably the most consistent surf spots in Spain. It is a more open area, with long beachbreaks and not as many reefs, although still high qualities ones. It is the is next to the Basque country and home to the summer surf holiday resort town of Noja, with the beautiful long Ris & Ajo surf beaches, perfect for beginners learning how to surf. El Brusco is just outside of the town and is one of the regions best Intermediate to Advanced waves. 30 kms past Noja is the small town of Somo with its beautiful long white sandy surf beach that looks across the city of Santander. Somo is a great base and home to some of the best Spain surf camps. The town is full of cafés and bars that spill out onto the beach. For the big wave surfers there is Isla de Santa Maria nearby, 12 feet of barreling waves! It only works in winter. Further West is Asturias, a more rugged region with the mountains running closer to the coast making for some spectacular scenery. Surfing holidays in Asturias will mean surfing a good mix of beachbreaks including the very consistent Xago, Salinas, Cueva and the most famous of them all Rodiles. It's a rivermouth wave similar to Mundaka but slightly smaller. It has a spectacular setting surrounded by a lush green pine forest. Much less crowded than the other regions of Spain, Galicia is one of the most consistent surf areas as it has breaks facing every different direction. The water is colder than the rest of Spain so travelling surfers tend not to reach it as much, which means a lot less crowded setups. The region is a great summer destination as it handles medium swell very well, it is not a great area for big surf. Galicia's most popuplar surf spot is Pantin, a powerful beach break that produces barrels in winter and great beginner/intermediate waves in summer. Spend some time here in winter and you will have a lot of waves to yourself. Not as well known for surf as its northern counterparts, Andalucia is on the South West corner of Spain, facing out onto Atlantic as it comes in to meet the Mediterranean. It is more popular as a kite and windsurfing destination however it is also an excellent place for a Spain surf holiday. The main surfing areas runs from Tarifa up to Cadiz with El Palmar being the most consistent spot. Summer is a great time for beginners here, learning to surf in surfing in the sunshine in warm water! Winter can be a mini paradise for Intermediates, all you need is a 3/2mm wetsuit. Tarifa is also great for windsurfing & kitesurfing if you want to mix it up. That's just the tip of the iceberg, you could travel for months surfing Spain's and surf a different break every day. We wrote a blog post about Spain's Top 5 Waves so be sure to check it out. Northern Spain has relatively mild summers, June to September averages 20-25 degrees Celsius. The area is Spain's green belt, the beautiful snow-capped Picos do Europa mountain range can prevent the clouds from disappearing too fast. This means the area see more rain than you would expect Spain to have, but it also means a beautiful lush green countryside. Water temperature is 18 degrees in the summer so you can surf in light wetsuits or shorts, making the northern region one of the most popular destinations for Spain surfing holidays. December to March are colder with temperatures averaging 12 degrees Celsius. Most of the Spain surf camps tend to be closed in the winter. Water temperatures are 12-14 degrees so a winter wetsuit is needed and maybe gloves & booties depending how cold you tend to get. 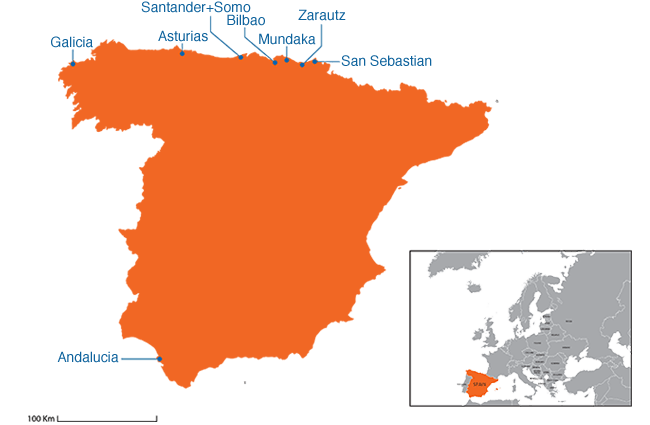 Southern Spain is a different story. The temperature averages around the early 30's from June to September so its short's and bikini's all day long. Water is a lovely 20 degrees . In winter air temperature drops to 15 and the water is also around 15, so a light winter suit will is best. 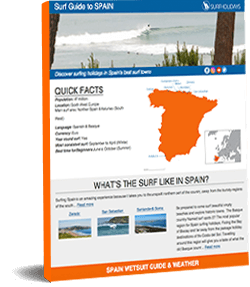 For a more detailed look at when & where to surf in Spain for your surf level use our Surf Trip Finder. Then browse each destination to discover the best selection & lowest prices. Book your surf holidays online now!